Each month I look forward to getting monthly gifts in the mail and by that I mean my cooking magazines. I get a couple of magazines and love them all but was shocked, like many others, to hear that Gourmet will be no more. I mean, it’s still hard to comprehend. So I really wanted to make something from a recent issue and use it for holiday baking and now this has become my homage of sorts to Gourmet. The October 2009 issue had a recipe for Browned Butter Pound Cake so it seemed prophetic to combine a favorite cake with some booze to drown my sorrows. 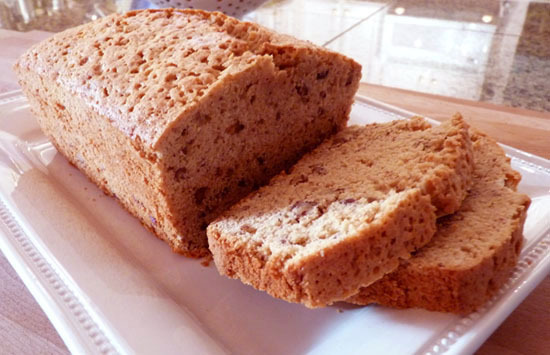 I love pound cake…that dense rich goodness can’t be beat. Then add to that browned butter…oh my! I thought for a holiday treat I would add nuts and up the ante a bit by toasting them. I make a cake with a rum butter component that is delicious and was hoping I could bring some of that flavor to this bread; hoping it would be the perfect loaf for the bread I always put into holiday baskets I create for friends and family. The result was even better than expected; but then how could anything be bad about a loaf of bread with a half cup of rum! Preheat oven to 325°F with rack in middle. Butter and lightly flour an 8 1/2- by 4 1/2-inch loaf pan. Beat together brown butter and sugars with an electric mixer until fluffy, about 2 minutes. Add eggs 1 at a time, beating well after each addition. Beat in vanilla and rum. At low speed, mix in flour mixture just until all flour is incorporated; add nuts and mix in lightly. Transfer batter to pan, smoothing top, then rap pan on counter to settle batter. Bake until golden-brown and a wooden pick inserted into center comes out clean, 1 to 1 1/4 hours (check at 1 hour; mine was done then). Cool in pan 30 minutes, then invert cake onto a rack and cool completely, right side up, 1 hour. Also, does this cake freeze well? I haven’t frozen it but it should be fine; it’s a pound cake so rather dense and freezing should not affect it. Do you think I could use toasted almonds instead of pecans? Almonds are the only nut I am not allergic to. Sure you can substitute any nut you prefer; almonds would be good with the browned butter and rum too. I tried the original recipe that I found on the Epicurus website and it was SO dry. Then I saw your review and the modifications you made and I’m going to try that next. What do you think about dividing the batter into mini loaf pans for gifts? How would you adjust the temperature or baking time? Though brown butter is slightly different from the Indian clarified butter ghee, I wonder if I can use that. Would make it so easy for me. And what would you substitute rum with ? I suppose that will totally change the cake if I used a Instant coffee or something. Let me know Hannah. I always under-cook a bit but I live at altitude and it’s drier here. Still, I cite what is typical for ‘flatlanders’ but all sorts of things affect baking results so do let me know if you change the baking time or try it without the nuts. Now I want some! I have a similar recipe called 151 cake that has toast pecans in the bottom on the bundt pan, 151 rum in the cake batter and 151 rum in the butter and sugar glaze. I had it in the car for snacking on a trip to Canada and the Border Guard took it because of the alcohol. I hope they enjoyed it!!! Hi – I am making this for a party. Do you think I could double it and put it in a pretty bundt pan? Thanks for the adaptation! I can't wait to try it. I don’t see any reason why you couldn’t do that. Might just require some additional baking time. I have a rum cake recipe too that I make in a bundt pan if you’re interested. Cake batter goes on top of walnuts and when done, you poke holes in the bottom of the cake, pour a rum/butter sauce into those holes and then invert the cake. Not on the blog yet but if you’re interested, let me know! I would love this Rum Cake recipe that you make in the Bundt pan and can’t wait to try your Brown Butter Pound Cake as well. That rum cake is one I’ve often thought I should revise and make all from scratch but friends have stopped me and they’re right. It’s nice to have a great dessert that can be made quicker with the ease of a mix…and the end result is so divine; why mess with a good thing, right? Hope you enjoy!